Inspired by Aaron Wall’s Hubfinder tool, we felt that with Yahoo’s API looking a little shaky and with our deeper data set, we could create something that would be especially helpful to SEOs. We proudly introduce Clique Hunter. Clique Hunter seeks out domains that link to multiple sites within a vertical. You can choose up to ten sites, which compete with each other over a given keyword or market, and start hunting! What you get back shows not only multiple links from a sites, but also the relative strength of the relationship, which is shown by the thickness of the connecting arrow. The darker the colour of the inbound domain, the more powerful that domain’s homepage is in terms of ACRank. In addition to choosing how many sites you want to compare, you can also specify the default minimum number of matches the tool needs to “count”. Clique Hunter then only returns sites that link to that number of the target domains. So if you compare 5 domains, with three matches, then Clique Hunter searches for domains that link to at least three of your five domains. How deep Clique Hunter searches to find these choice sites depends on your subscription level. On a free package, you only get to see the top three matches and also you get an idea of how many more you could get on a subscription package. Thereafter, we compare the top 1000 referring domains of each site for Bronze, 3000 for Silver, 10000 for Gold and 25000 for Platinum, assuming the sites have that many referring domains in our index. Also, with any subscription, you get to see exactly how many links exist between the domains and you can delve into these further should you wish, by generating reports on domains that interest you. Clique Hunter attempts to visualize the links, but as you start searching for more and more and more matches, you may find the tabular layout better or simply click the “CSV” button below the table to bring the data into a spreadsheet for your own use. Visualization is capped to the top 10 domains per page. Q: Can I search at the subdomain level? A: Not at this time – only the root domain to keep the tool fast and effective. Q: Why I can only see “ticks” not backink numbers? A: You need to have a paid subscription to see actual numbers. Q: Do I have a usage limit? A: We do not meter this in your subscription, but we will block users that automate queries or use the system too much in one day. Q: What is this “Depth” number on the chart? 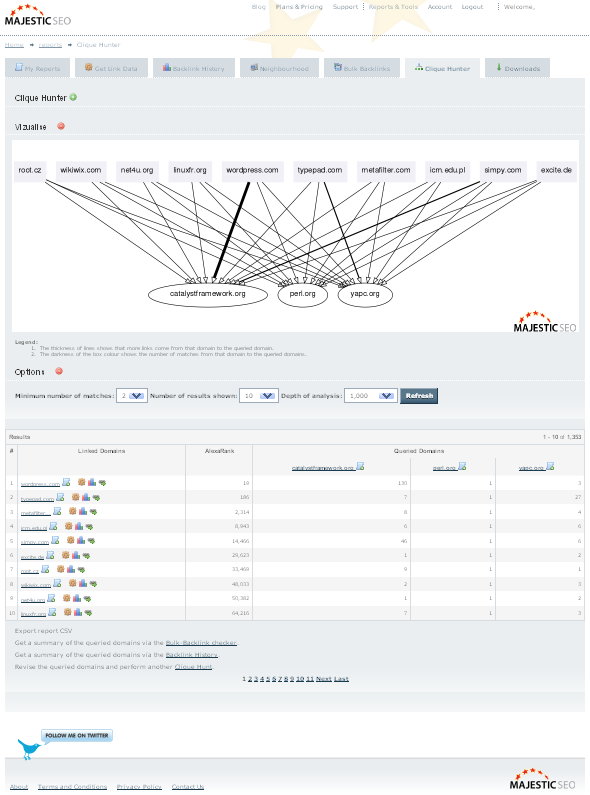 A: This shows the maximum referring domains Clique Hunter will have searched (starting with the strongest) in its hunt. The higher your subscription, the deeper the search. Q: I keep on seeing sites like Blogspot.com. Why? A: Some sites have huge numbers of subdomains, run by different people. These sites can cover all sorts of topics and demographics, so will often show up at the root domain level. Looks excellent – very useful. Can I make a quick feature suggestion? It would be great to be able to find sites that link to [list of competitors in my niche] that DON’T link to [my site] – as they’d be then best prospects. (I guess you can do this by looking at what’s ticked – but excluding sites that already link to your own site in the search would be faster). This looks great, I can’t wait to use it when I get home. Good stuff Dixon, nice move! BTW: What are you thoughts on YSE as to how long they’lll still be around? Thanks guys… but I take no credit! There’s a guy called Matthew here that has been slaving over this for months. Max – you can get this now by exporting to CSV and resorting the data. Steven – Not for me to say about Yahoo’s intentions. Obviously, I wouldn’t bet on a long term strategy for YSE in its current form! I dont see Clique mentioned in your subscription pricing. Is it automatically included with the other subscriptions or is there a separate price? Yes – it is included in all packages, but we analyze in more depth depending on your subscription. With Bronze, you get up to 1000 matches, with silver I think it is 3,000… Gold: 10,000 rising to 25,000 on platinum. So you do get more for your money. We will be looking at server loads over time, so this data is only correct as of today’s fate (18 November 2010). The number of times you can use Clique Hunter within your subscription is currently un-metered – so go wild (but not with a scraper please… we have APIs for that!). BOINC was deemed not suitable for our purposes 6 years ago when development first started and it is too late to change that (our crawler works well in parallel with BOINC). Hi there. I’ve only recently started using this tool and have to say, wow. It’s really good at point out the domains that my competitors use for backlinks. However, how do you go one step further and find the exact URL’s of the site where they are linked to rather than spending time and scouring the root domain. For any one of the sites, you can get a full back-link report. Look for this icon on the page. From there you can either get a standard report (which returns the strongest links that we have going to any given web domain) or the advanced reports, which give ALL the backlinks. Of course, you need to be on a paid subscription to do this.